Eaton senior Owen Baumann gains control of the ball during the Eagles match with visiting Franklin on Thursday, Sept. 20. Eaton won the match 5-1. 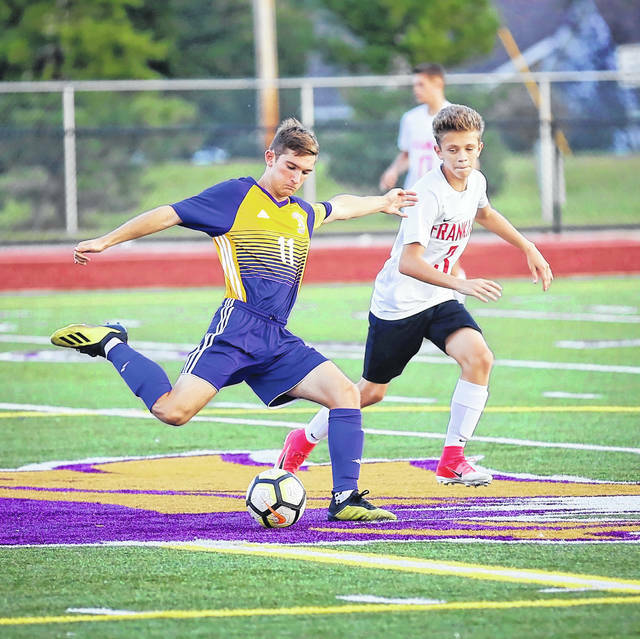 EATON — Eaton’s varsity boys’ soccer team stretched its unbeaten streak to nine last week and pushed its overall record to 8-2-2. 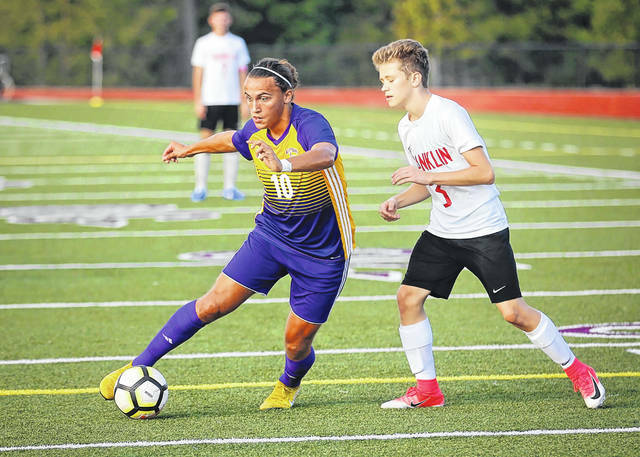 The Eagles were 2-0-1 on the week, including a tie in their rematch against SWBL defending champion Bellbrook. Eaton defeated Bellbrook earlier in the season, 2-1. The top of the standings in the Southwestern Division of the SWBL include five teams with at least four wins and two or less losses. Monroe stands on top with a 5-0-3 record and yet unbeaten in the division. Eaton also has five wins and a 5-2-1 mark. 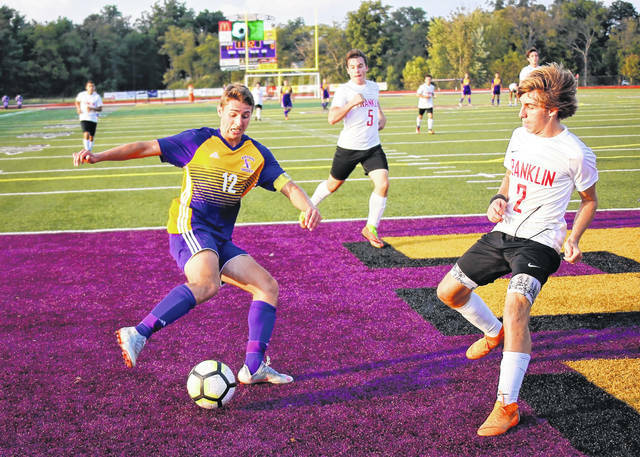 Bellbrook (4-1-3), Valley View (4-1-3) and Oakwood (4-2-2) round out the top five. Three of the Eagles final four regular season matches are against one of these opponents. They were scheduled to travel to Valley View on Tuesday, Sept. 25, their lone game of the week. Their remaining schedule includes Brookville, Tuesday, Oct. 2; at Oakwood, Thursday, Oct. 4; and at Monroe, Tuesday, Oct. 9. 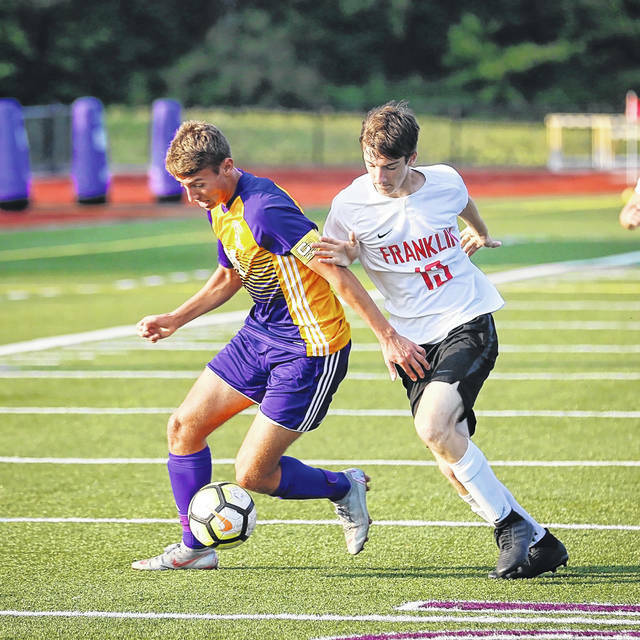 Against Bellbrook last week, both teams scored in the first half, but could not find the net in the second frame as the match ended in a 1-1 tie. Eaton’s lone goal was scored by James Howard off of a corner kick from Nate Gard. John Altom had two saves in the first half as the Eagles controlled possession for the most the opening 40 minutes. Bellbrook put more pressure on Eaton in the second, but the Eagles defense held strong and Ethan Burrell had 11 saves. Eaton got off to a slow start against Franklin in its 5-1 win over Franklin. The Eagles scored two goals late in the first half to take a 3-0 lead. Gard had two of those goals, along with Howard scoring the third. Howard and Gard also provided the assists for each other’s goals. Owen Baumann got into the scoring column with a goal in the second half. To cap the scoring Gard and Howard connected again with Gard scoring off the Howard assist. Eaton capped off the week with a 4-2 win over Kenton Ridge on Saturday in non-SWBL play.